Sunglasses: Quay. Crop: Asos. Shorts: Who I Am. Shoes: Kmart. Sorry for the nearly four months hiatus. To be honest I have had incredibly low self-esteem lately and that has completely put me off taking new pictures for my blog. After the initial delight of dying my hair bright red wore off, I hated it, with a passion. I have wanted to grow my hair for so long and it never gets past that weird bob stage. So I let myself get a makeover, I had a full head of tape in hair extensions done along with a new colour, I had my makeup done and bought new clothes. This gave me a massive confidence boost. I have been doing things while I have been away. I went to Victoria for a week and had a little solo-shopping trip to Melbourne city afterwards but being in the middle of that rut I took no pictures. I climbed Mt Warning at three in the morning to watch the sunrise with some friends. I finally got my motorcycle license and am currently looking at buying a Kawasaki Ninja! Also, I booked tickets for my bestfriend and I to go to Japan in April next year and I am flying out of Japan straight into a solo trip through Europe! Anyway along with my new hair my style took a complete U-turn. I was starting to lean towards tight, chic and monochrome looks to go with my bright red bob. But now with long flowing brown curly hair I am definitely feeling the bohemian trend for this summer in Australia. Neutral tones, faux suede, crochet and festival inspired looks. I think these shorts are totally adorable with the little cut outs along the scalloped edges and soft faux suede material. 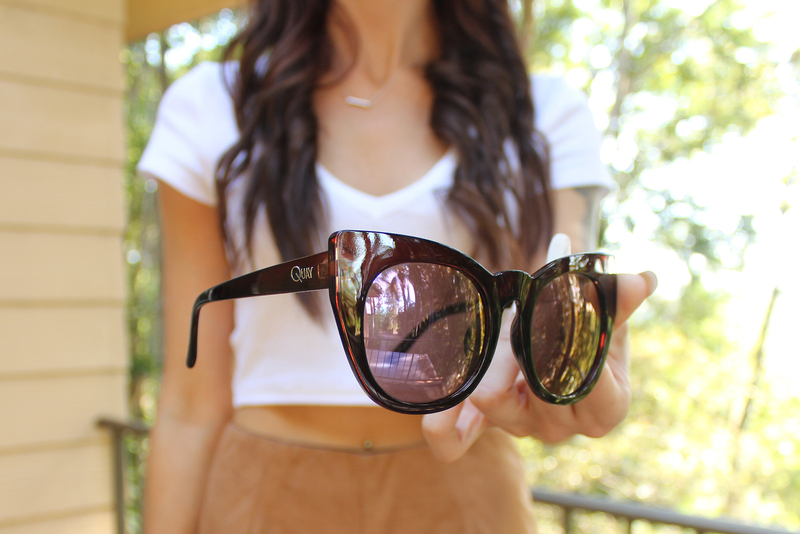 Quay Australia sunglasses have completely taken off finding them in many boutiques around the Gold Coast and on ASOS! They have a wide range of unique style and are 100% UV protective and surprisingly affordable. I have never felt I could put off a cat eye style but I found these actually suited me, so I bought another pair in black. I hope I can keep up blogging this time. If you’re still reading or a new reader leave your blog in the comment section so I can check it out! It is surprising ho much our hair changes out mood. you look great! I love your shorts and your sunglasses! their sunglasses are amazing, so jealous you're going to japan! That sunglasses is dope!! You look cute. I'm glad you returned to blogging! Your hair looks great and I love your sunnies too! Beautiful. I love the sunglasses :) I love your tat. Wow what a change! But you look amazing girl, you have a dream body, and you're too pretty! Love the look! You look lovely and those sunglasses are gorgeous. Thanks for sharing wonderful sunglasses and love your outfit.Its awesome. Now a days everyone looks for deal of the day products in online shopping. You rock those gorgeous sunglasses ! Love the shorts, they are adorbs :-)Japan sounds lovely¨wish you great tarvels. Stunning outfit, neeed those glasses! Wow, so nice. I love your sunglasses. Thanks for sharing your style with latest sunglasses.